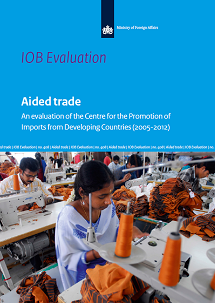 This report presents the findings of the evaluation of the Centre for the Promotion of Imports from Developing Countries (CBI) and its contribution to Dutch Private Sector Development (PSD) policy between 2005 and 2012. The evaluation uses a mixed-methods approach to investigate CBI’s sectoral export coaching programme and the business support organisation development. The report concludes that CBI’s sectoral export coaching programmes were relevant, though often insufficient to stimulate companies to start exporting to Europe, mostly due to unclear or misguided targeting of participating companies and target countries. Business Support Organisation Development interventions, on the other hand, were generally relevant, but there is little information on their effect on the PSD goals. Although CBI operated relatively independently from the ministry during most of the evaluation period, the ministry has already become more prescriptive in what it expects from the organisation. A results-oriented management model with ex post transfer pricing and a reinforced monitoring & evaluation system are necessary to further improve CBI’s operating efficiency.